Socialize What Can Happen If You Don't and What Can Happen If You Do? Word to the Wise: Socialize! What Can Happen If You Don't and What Can Happen If You Do? THE BOTTOM LINE: If you don't socialize, you are going to have a scared dog, and if you do it wrong, you might have a sick dog. Make sure you fully understand the pros and cons, as well as the responsibilities associated with choosing early socialization. One of my biggest goals as a dog trainer is to educate the public, veterinarians and pet owners alike about the real need and proper methods for socializing dogs. It's a common train of thought that you shouldn't take a dog anywhere until it's had a full series of vaccinations which is typically after 4 months of age. But proper socializing should be done before that, provided it is done in a way that does not contribute to the possibility of a dog contracting a contagious disease before it has fully developed its immune system. Even though I have been safely training and socializing puppies for over 20 years, I consulted several veterinarians while researching this article. All of them agree that proper early socializing is advisable; in fact, they do it with their own dogs. However, they advise their clients not to do it because they feel that nobody can be sure of what dogs they might encounter if they are anywhere in public. I want to emphasize that I am advising you to be absolutely certain that you do not take your dog anyplace where they could come in contact with unknown or unvaccinated dogs. A few years ago, I trained a Rottweiler puppy for a client. Although Rottie's are particularly susceptible to Parvo Virus, I took Moses immediately to all of the places I felt were safe, including bringing him to my own puppy socialization and training classes. Of course, I kept him on a schedule of vaccines as guided by his vet. Today Moses is almost 4 years old and has no history of health problems. More importantly, he's a well-balanced dog and although protective when he needs to be, Moses is friendly to people and dogs and comfortable in any environment. This is due to his proper socialization as a puppy. In addition, many vets also agree that this exposure at a young age actually strengthens the immune system, making the dog better able to fend off disease later in life. In my 22 years of teaching puppy classes, I have never had a dog get sick in my class. One puppy had to be treated for Parvo (which they contracted elsewhere), but because the owners learned the warning signs in my class, it was caught early, treated and the dog soon returned to class. IMPORTANT!The window of opportunity for proper socialization is very small, and should be completed before the puppy is 13 weeks old. 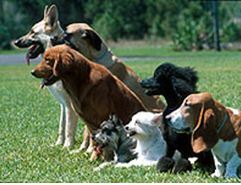 There is absolutely no question that proper socialization does serve to eliminate a lot of stress later in a dog's life. Many more dogs are put down because they end up in shelters due to fear issues caused by poor socialization than dogs that contract disease from early socialization. Another reason many people wait to begin socializing their puppy is that they think socializing is only about being around other dogs. The truth is accustoming a puppy to new people and places is far more important. It's tremendously difficult to live with a dog that fears people or different environments but it is possible to manage a dog that doesn't get along with other dogs. Avoid potential danger by controlling the conditions under which you socialize your puppy. You certainly can invite people to your home to meet the puppy and take it to friends' homes where you know the dogs. The definition of socializing is accustoming the dog to all the situations that it's going to face over the course of its life. A puppy needs to have pleasant experiences with all types of contingencies. The optimum socializing period for dogs ends at about 13 weeks, although results may still be attainable up to 17 weeks. Proper early socialization will help the dog generalize and be equipped to handle new things they might encounter later in life. Effectively socializing dogs includes introducing them to a large, diverse group of people of all ages and races, who are wearing different clothes, uniforms, hats, glasses, etc. Expose them to different types of surfaces such as cement, gravel, grass, dirt and blacktop as well as different environments like the woods, the city and various neighborhoods. Walk them in crowds, down high traffic streets, past construction sites, and playgrounds full of screaming kids. Familiarize them with a variety of sounds like vacuum cleaners, blow dryers, gardeners with leaf blowers, ambulance sirens, and especially fireworks. There certainly are some places where it's not safe to take puppies before they are fully vaccinated. These would include the beach, dog parks and other areas where you may find unfamiliar or unhealthy dogs. Keep in mind that having free play with other dogs may end up being an unpleasant experience if it overwhelms your puppy so it could actually be detrimental rather than beneficial. However you can certainly make play dates with your friends' healthy, vaccinated and friendly dogs and participate in puppy classes that require proof of vaccinations. It's my strong belief that waiting to socialize dogs until they've completed their vaccinations is counterproductive. Once a dog is older than 4 months, the experience cannot be considered socialization and will require the expertise of a qualified dog trainer who has the ability to counter-condition them as they face potentially negative situations. Just as you wouldn't forego your dog's vaccinations, neither should you avoid properly and safely socializing your puppy.